Small heat exchanger cleanings can present challenges including limited accessibility, smaller diameter tubes, and deposits. AES has various types of equipment at its disposal that allows us to adapt to most of the unique situations that can be encountered in an industrial environment. AES has cleaned small heat exchangers ranging in size from as few as 40 tubes upward to 3,200 tubes. The first option in small heat exchanger cleaning is to use the Quick-shot air and water or the water pump systems that AES uses during main condenser cleanings. These systems allow for time efficient cleaning; should tube size and / or accessibility not allow for the larger equipment, AES relies on the Goodway AWT-100X tube cleaning system. This system has the power and versatility to clean virtually any tube in wet or dry mode. The speed and torque of the unit’s flexible shaft is controlled by the cleaning operator so the AWT-100X can adapt to the various type of deposits. AES typically uses the AWT-100X in the wet mode to ensure a quality flushing during the cleaning. Many different types of cleaning ends can be fitted to the end of the AWT-100X shaft for whatever deposits are encountered. These cleaning ends range from a nylon brush for light deposits, stainless steel wire buffing tool for light to medium deposits, or a PCH-180 abrasive cleaning end to a carbide drill tip when the tubes are heavily plugged with debris. Depending on the deposit, several passes of various cleaner tips may be required to return the tube to its maximum efficiency. AES’ philosophy is to “bring the heat exchanger out of the plant and onto our customer’s desk”. 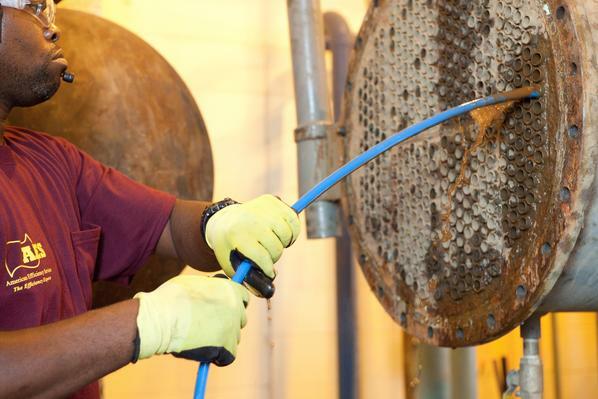 If plant personnel have a clear understanding of the tube conditions during the cleaning they can make critical decisions immediately and prior to the system being closed. “Before” photographs of the heat exchanger waterbox, tube bundle, and internal tube will be collected to identify the “as found” condition. Abnormal or unique situations identified during the cleaning will also be photographed and documented. Upon completion of the cleaning, “After” photographs of the heat exchanger waterbox, tube bundle, and internal tube will be collected to record the effectiveness of the cleaning. Individual photographs and summaries can be immediately provided to plant personnel either by flash drive or e-mail directly from the work site. At the conclusion of the cleaning all data will be compiled into one comprehensive report and delivered to the customer. A state of the art boroscope is used to collect the internal “before” and “after” photographs of the tubes. The boroscope is capable of capturing still photographs or recording video as the inspection probe is passed down the length of the tube. These photographs identify the condition of the buildup prior to the cleaning, and the effectiveness of the cleaning afterward. If debris lodged in a tube is unable to be removed, the boroscope can be used to identify the type of debris. Identification of the debris can assist in determining whether or not the tube should be plugged regardless of the tube being evacuated of the debris. The boroscope has also been used by customers while AES crews were on-site to conduct foreign material post job inspections of other job sites within the facility. Although they may be smaller in scope, AES’ commitment to safety is not reduced on small heat exchanger projects. These exchangers provide their own unique safety hazards that are discussed by AES crews during the Job Safety Hazard Analysis, Pre-job, and Mid-day Safety Briefings.